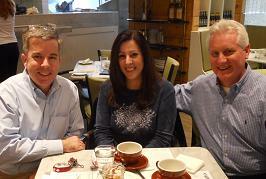 On an extremely last minute trip to Toronto, I was so fortunate to catch lunch with two voice over greats based in my favorite city in the world. Both Jodi Krangle and Patrick Sweeney were at Faffcon but I’ve known both long before then and I was so lucky that they had time in their schedules to meet with me. 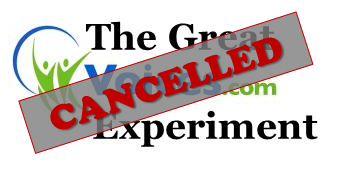 We covered everything from the Great Voices.com Experiment, to Faffcon to so much terrific voice over minutiae it would make your head spin. As usual, mostly I wouldn’t shut up but they are both so wonderful to hang out with and learn from, I just wanted the lunch to go on and on. My sincere thanks to both of them and I hope I get to go again soon to meet up with them and so many other great voice over friends in TO (and thanks Patrick for the shirt which I love!). 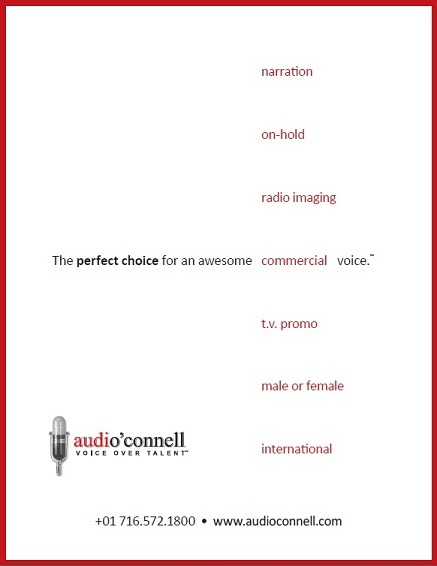 This is a copy of a recent audio’connell Voice Over Talent print ad I designed for an association newsletter I had space in – whaddya think, clean and crisp or too artsy with no real message? Look, most men (and some women I would guess) look for an excuse not to shave. Well fellas, in the month of November, we got a whopper! 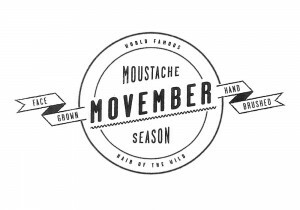 It’s a fund raiser called Movember and the concept is to raise funds and awareness for Prostate Cancer and other male Cancers all month long. The facial hair is to create awareness and spur friendly donations for the cause. Cancer has hit my family and I’m sure it has hit yours too. My friend Jeff Kafer put out a request to start a team on the VO-BB and now a bunch of us are on there. Here is my request to my blog readers: Please donate $5.00 to my effort (if you want to do more or less -that’s cool too). Here is my page to donate on and yes I will post pictures. Now the rules say I have to grow a mustache and that’s all I am supposed to grow. Again, if you can help, I’d be appreciative. Thanks. I have been sooo darn remiss in my logo blog posts. I know most folks here like my voice over posts but I have aligned yet varied interests…logos being a weird obession of this guy who can’t draw a straight line. So earlier this week, the CBS Television Network celebrated the 60th Anniversary of their “Eye” logo – with their wordmark, its a logo I have always liked. Here is a nice piece by CBS News’ Charles Osgood on the history of this world famous icon. Dan Lenard and George Whittam have invited me as their guest tonight on East West Audio Body Shop which airs via USTREAM at 9:00 pm ET and then is available on their EWABS web site.